The Dinner Deck or middle level is set with tables and chairs and has panoramic views of all the beautiful sights that Lake Minnetonka has to offer. It is the deck most guests choose to sit and have dinner. 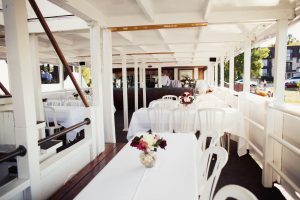 All centerpieces, table coverings, and nautical decorations are part of the boat, and our crew will gladly assist with any set-up you may have. The sound system is available for piping in music, just bring your own music device or we will play our appropriate music! The dinner deck is set with table seating for 50 and offers great views. 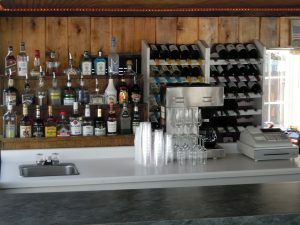 While cruising the shores of this historically rich and beautiful lake, the guests may choose to order a beverage from our fully stocked beverage station located here. We proudly serve the finest beverages available. The Dinner Deck is normally an open air deck, however, if weather dictates, we have clear, deployable roll down enclosures to allow for inclement weather.